When Rog suggested we attend Pfeiffer's winery's 30th birthday dinner, I agreed immediately, knowing that I'd get a couple of days' birding in Chiltern. Pfeiffer's is in Wahgunyah, so we stayed at our favourite Rutherglen motel, the Wine Village. We drove up on Saturday 26 April, stopping along the way at the Grass Tree roadside reserve, ostensibly for coffee, but really to look for birds. There is a very pleasant walk here and, over the years, I have seen some good birds at this spot. And also some very pretty wildflowers. On this occasion, I managed to do the entire walk without seeing one bird. Unprecedented. Then we had coffee while Superb Fairy-wrens played around our feet and Weebills serenaded us from the canopy. Altogether, Saturday was not a very birdy day. 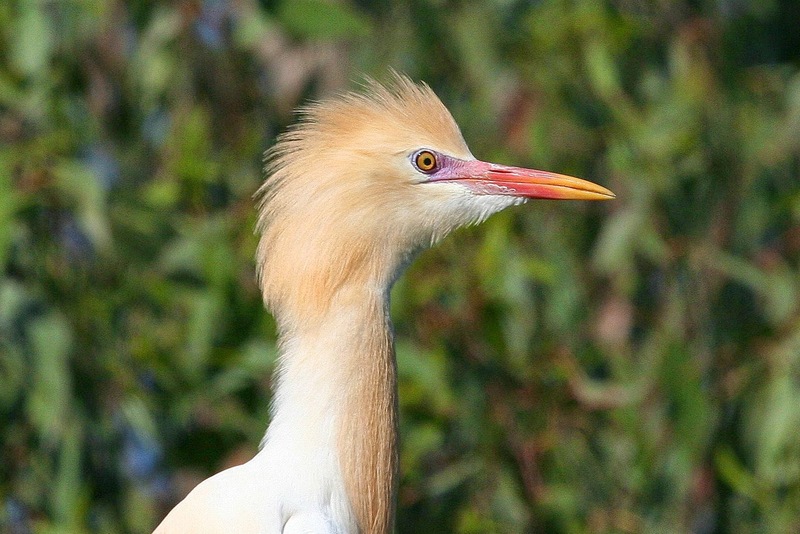 The only noteworthy record was a paddock full of Cattle Egrets beside the Hume - my first for the year. Sunday was perfect: beautiful autumn sun. I had great expectations. First stop was the ephemeral swamp in Rutherglen near the tip, often the site for good birds. Not today. There was water in the swamp and a few ducks, but no crakes, no waders, no dotterels. The best I could do was a Tree Martin. I was sure I'd do better at Bartley's Block. We arrived to see a car parked near the gate, an unusual occurrence. I usually have the place to myself. The occupants told us that they'd seen a Regent Honeyeater here the day before. Now I really did expect some good birds. A male Scarlet Robin flew by to confirm that I was right. However, he turned out to be the best bird I saw. As we drove to Greenhill Dam, a pair of Turquoise Parrots flew by. Sittellas put on a beautiful display for me at Cyanide Dam, where the Brown Treecreepers were more scarce than usual, and, perhaps for the first time, I did not see an Eastern Yellow Robin. We visited No 1 dam, then No 2 where the most interesting sighting was a female Flame Robin. I started Monday morning with a walk around Lake King in Rutherglen. I saw 24 species before breakfast, the most interesting being Tree Sparrows, which I saw in the main street of Rutherglen opposite our motel, amongst a flock of House Sparrows. We checked out Lake Anderson in Chiltern, then drove to McGuiness Road in the Mt Pilot section of the national park. This is where I look for quail-thrush. I walked along the road in the sun. It was very pleasant but there were very few birds, and no hint of quail-thrush. Next we visited Woolshed Falls, stopping to check out the ducks at the waterworks on the way. There were some Blue-billed Ducks on the dam, but they insisted on staying as far from the road as possible. In Beechworth, we did the tourist drive, and ticked Satin Bowerbirds on schedule at Lake Sambell. Then we returned to the national park in Chiltern, where I walked along Tower Hill Road. I did see some button-quail platelets, but sadly, no button-quail. At Cyanide Dam, the Sittellas were in the same tree they'd been in yesterday. I disturbed a Common Bronzewing and admired White-naped Honeyeaters as they splashed in the dam. Tuesday was grey and it rained most of the way home. I enjoyed my time around Chiltern. I always do. However, I've never before come home thinking that the highlight was lunch at a winery, rather than the birds I'd seen. White-necked Heron - more common than usual? I have just returned from an aborted trip to Nelson Bay. Rog and I got as far as Dubbo, when the call came that last Sunday's pelagic out of Port Stephens had been cancelled. It won't take too much longer for trip organizers to realize that as soon as I book on a pelagic, the trip is doomed! We left home on Wednesday and drove for three wet days to get to Dubbo. As soon as we turned for home, the sun came out and we had a delightful drive home. The only bird of note on the first day was a paddock full of Cattle Egrets - my first for the year. The next day, notwithstanding the almost constant rain, I birded at The Rock (south of Wagga) and Migurra Walk (outside Cootamundra). When my book 'Best 100 Birdwatching Sites in Australia' first came out, there was some discussion on Birding-Aus about my site selection. Someone said that The Rock should not have been included. I thought at the time that whoever made that comment should revisit the place with an open mind. The birds there can be terrific. They can be. But they weren't last week. The only bird I saw was a White-throated Treecreeper. But then it was raining. It had stopped briefly when I arrived at Migurra Walk. I saw some honeyeaters and thornbills, some thickheads, several Striated Pardalotes and the ubiquitous Grey Fantail. Nice birding, but nothing special. On Friday, we drove to Dubbo in the rain. Not many birds, but I did notice that there seemed to be lots of White-necked Herons. More than I'm used to anyway. 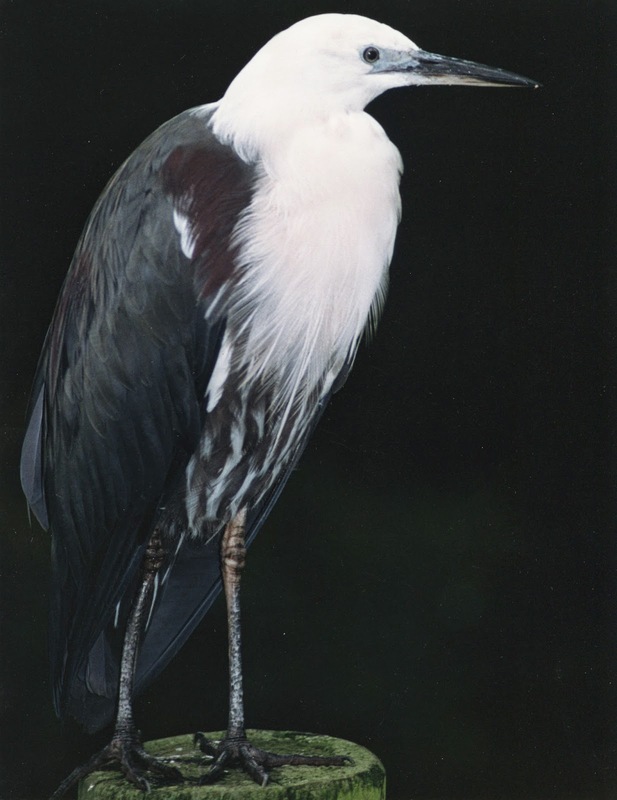 Some years ago, we had an irruption of White-necked Herons at Werribee. They are not rare birds, but they are not usually quite so common. As soon as the call came through that the pelagic was cancelled, Roger turned for home and the sun shone. Without the rain, I expected to see many more birds. Alas, it was not so. We actually saw fewer birds on the return trip. On Sunday, the day I was supposed to be out at sea, notching up rare seabirds, I was birding in perfect conditions around Cootamundra, back at The Rock, then at Wonga Wetlands in Albury - three of my top 100 sites. There was little of note. I managed a Musk Duck and an Australasian Shoveler on Bethungra Dam and a Western Gerygone at The Rock, but that was about it. On Monday, we drove back to Melbourne from Wodonga, stopping at two of my favourite spots: Chiltern Park and Cyanide Dam. The sun was shining and the birds were singing. I saw my first robin for the trip at Chiltern Park: an Eastern Yellow. Then a family of Scarlet Robins greeted me at Cyanide Dam. There was also a mixed flock of thornbills and Superb Fairywrens including at least one Speckled Warbler. I hadn't seen Speckled Warblers at Cyanide before, so that was special. It is always enjoyable to go birding - even when it is raining and the birdlist disappoints, I remain hopeful that something exciting will appear around the next corner. Conversely, it is always most irritating when a pelagic is cancelled. Hopes for that rare seabird are dashed. I tell myself 'next time,' but somehow it doesn't quite work. My Pollyanna attitude only goes so far. After all, a missed tick is a missed tick. I recently visited Ashmore Reef aboard the luxury catamaran Reef Prince. It was an 8 day cruise leaving from Broome on Wednesday 26 March 2014. There were 29 of us on the boat: 16 birders (plus two students and two world travellers) led by George Swann, Adrian Boyle and Mike Carter, in addition to the captain and five crew. Trips to Ashmore Reef have normally been in spring when birders hope to see Matsudaira's, Swinhoe's and even Leach's Storm-Petrels. This inaugural autumn trip was aimed at rare passerines. A bus picked up all the participants from their various lodgings in Broome (nearly forgetting one hapless fellow, who was sitting patiently waiting when we belatedly returned for him!). We were delivered to the beach and expected to wade out to a dingy. In the surf a helpful assistant intercepted my slow progress to hand me a name tag. How very thoughtful. I didn't swear at her. Instead I clambered aboard the dingy. No one said I had to be elegant. The Reef Prince was a beautiful boat and I had a very comfortable room. We had early starts every morning and everyone retired to bed directly the evening meal was over. I found a DVD about the identification of storm-petrels and lay on my bed watching it happily. The first day was characterised by Hutton's Shearwaters in the morning and Streaked in the afternoon. We saw Common Bottlenose and Swarf Spinner Dolphins, one large manta ray, several sea snakes and lots of pretty flying fish irrupting from under the catamaran like water from a fountain. I believe I identified six different species of flying fish. At breakfast on the second day I suggested that this might be the best day of the trip. We would be travelling all day. I would not have to get into a small boat. 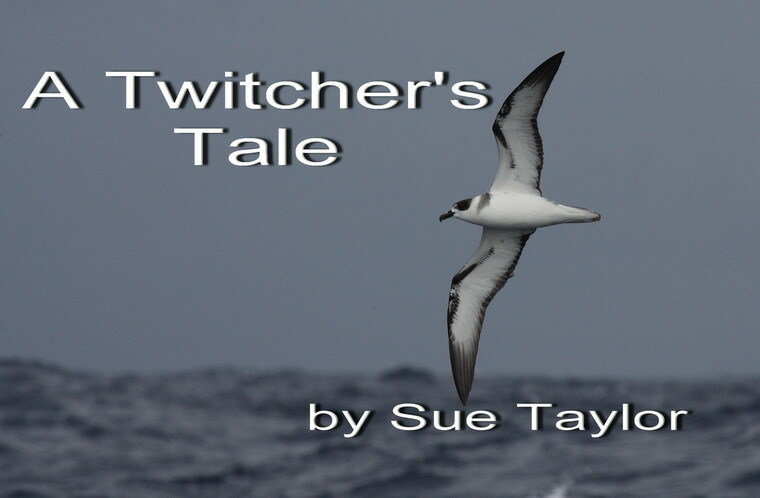 And there was a good chance of a lifer: Bulwer's Petrel. Sure enough, I was on deck at 5.40 a.m. and was greeted by a Bulwer's sitting on the water in front of the boat. We were to see a total of 68 Bulwer's that day, and a couple of hundred Wedge-tailed Shearwaters. We were to see Bridled, Sooty and Crested Terns just about every day of the trip. The birds we saw most were Brown Noddies and Sooty Terns, followed by Lesser Frigatebirds and Brown Boobies. Early that morning, an inquisitive Abbott's Booby flew over the boat for a close look, and, later in the day, we were buzzed by a customs plane. We saw our only Short-finned Pilot Whales that day too. It was very hot, so I sat in the shade at the back of the boat and chatted with Biggles, who had recently been guiding Pearl Jordan (the woman assuming Phoebe Snetsinger's number one world birding spot). Biggles, a renowned Darwin birder, told me that he had seen 799 Australian birds. The next morning we saw what we assumed to be an illegal Indonesian fishing vessel. We also saw a drum in the water called a FAD - a fishing aggravation device. How it worked I do not know. We arrived at West Island in Ashmore Reef at lunchtime on day 3. At about 5 hectares, West Island is the largest of the three islands. Ashmore Reef is uninhabited but because of assylum seekers, there is a very visible Navy presence. I struggled onto a dingy and (with the help of fellow passengers) managed to get off at the other end. While I was wading ashore, I lost the soles off both my Tivas, so it was barefoot for me thereafter. Walking around the island was hot and difficult. The beach is a minefield of turtle holes and, off the beach, vines trip your every step. West Island has two prominent coconut palms. Large bushes are dotted around the edge of the island and the rest of the land is covered with grasses, shrubs, vines and bushes with various degrees of penetrability. One patch of spinifex was particularly impenetrable, so of course, a line of brave birders walked through it several times, while the rest of us watched to see what they'd flush. Nothing. While walking across the island we'd often flush Buff-banded Rail and once Biggles set up a small snipe. We examined every bush carefully looking for any small bird. Each time we visited West Island, we saw different birdlife. The predominant bird on that first occasion was the Sacred Kingfisher - we saw about sixty. We also saw Eurasian Tree Sparrows, a Shining Bronze-Cuckoo, an Oriental Cuckoo and an Oriental Reed Warbler. There were several Red-tailed Tropicbird nests with chicks at different stages of development. I was hot and irritable and tick-less. We visited West Island three more times. There were always Reef Egrets on the beach. I reckoned the ratio of white to dark morph was about five to one. We saw lots of waders, mainly Greater Sand Plovers, Whimbrels, Grey-tailed Tattlers, Ruddy Turnstones and Sanderlings. We saw one White-winged Triller, a couple of Barn Swallows, one Oriental Dollarbird, one Rainbow Bee-eater and several more cuckoos. The only heart-pumpingly rare passerine was quite an anti-climax as it was identified days after it was seen. John Weigel and Biggles found a warbler which they thought was something other than an Arctic Warbler. As an Arctic Warbler can only be identified conclusively by its song, we all surrounded the poor little bird, willing it to sing. It did not. Photos were taken. Everyone saw the bird fly and a few of us saw it perched. It looked like an Arctic Warbler to me, but what would I know? After much debate and deliberation, the experts decided it was a Yellow-browed Warbler. Yippee! Another tick. After our early visit (5.30 a.m.) to West Island on day 4, we set off again to circumnavigate Middle Island. At 2 hectares, this is the smallest of the three islands and it is deemed too sensitive for us to land there. This is fine by me. I'm quite happy not having to get out of the dingy. Middle Island was populated maily by Brown Noddies, followed by Lesser Frigatebirds and Brown Boobies. There were also about thirty Red-footed Boobies and half a dozen Masked Boobies. Everyone (except me) clambered ashore on a nearby sand cay, which was well populated with waders. I stayed on the dingy in the shade with my water bottle, watching my hot thirsty comrades looking at the waders I could see from my shady seat. On the way back to the Reef Prince we saw a large tiger shark in the shallows. On day 5 we visited West Island twice - very early as usual and again in the afternoon. We found lots of tiny baby turtles, dead on the sand. We were told that this was due to the invasive fire ants. They bite the baby turtles which are then disorientated and head inland instead of out to sea. Late that morning we visited East Island, half the size of West Island at 2.5 hectares. This was undoubtedly one of the highlights of the trip. It is home to squillions of noddies: 35,000 Brown, 2,500 Black and just 10-20 Lesser. Many people were excited to see Lesser Noddies, the most difficult of our noddies to tick. Brown Boobies were sitting on eggs, usually one or two. The Sooty Terns were (as always) very vocal. Luckily they were not yet breeding. George told me that their behaviour is well synchronised and when they're breeding they fly in the air and intimidate intruders. This is called the dreads and I'm pleased I wasn't sujected to it. On a nearby sand bar we admired thousands of waders - mainly Bar-tailed Godwits, Grey-tailed Tattlers, Greater Sand Plovers and Great Knots, but including several Asian Dowitchers in breeding plumage. Spectacular! Everyone was exhausted, compounded by the heat, the early starts but, mostly, the lack of rarities. We set sail back to Broome at 9 a.m. on day 6. A Red-necked Phalarope created great excitement landing on the water beside the boat and swimming in circles for us. I confess I was much more excited by a Jouanin's Petrel that flew past, obligingly giving everyone a good look. My third tick for the trip and a good one too. What's more, it was Biggles' 800th bird. Well done, Biggles! Day 7 was an uneventful day at sea. We paused at the Lacepedes on day 8 and were disheartened to see so many Silver Gulls. The Lacepedes are a very special place - lots of waders and turtles, but it was difficult for them to compete with the magnificent East Island we'd experienced two days before. The only other bird we saw was a few Lesser Crested Terns flying past as we neared our mooring at Broome. The fiasco of disembarking was worse than getting onto the boat a week before. Of course it was a wet landing. We were expeced to carry our own luggage onto the dingy. If passengers had not helped, the crew could not have coped. There was no explanation or apology for these wet landings in Broome. I do not know why they occurred. The crew are so adept at jumping on and off little boats and into and out of the water, that they really think nothing of it, and have no comprehension how difficult it can be for women of a certain age. And it really is a shame to finish such a great trip on an unnecessarily sour note. I must thank George Swann, Adrian Boyle and Mike Carter for their incomparable knowledge and expertise, and all my fellow participants for their company, bonhomie and most particularly, their assistance in getting on and off those wretched little boats. When I booked to visit Ashmore Reef, leaving from Broome on Wednesday 26 March 2014, I arranged a day's birding in Broome beforehand. My requirements were the Semipalmated Plover and the Common Redshank, and my guide was George Swann. George picked me up at my hotel at 6. He had Dr Rob Hamilton, a birder from Hobart with him. For the day, I managed 94 birds, despite the heat. George and Rob, who spent hours wading through ankle deep wetlands, saw several more. The day started well at the sewage works where we had immediate and excellent views of the Semipalmated Plover in breeding plumage. It was more brightly coloured than the drab bird I'd seen illustrated but I confess I did not notice that its bill was orange at the base. The Semiplamated Plover is an American bird breeding anywhere in the far north from Alaska to Newfoundland. When I'd learnt before I left home that the bird was in breeding plumage I was worried that it might leave before I could get there. I later learned that it always leaves on the same day in April. A creature of habit indeed. We also saw both races of the Yellow Wagtail cooperatively playing side by side. There were several other waders, including Black-wnged Stilt with some very cute chicks. 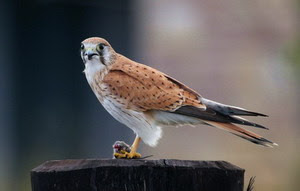 From the sewage works we went to Station Hill looking for raptors. Here I saw my first giant burrowing frog, which was fun, even if not very raptorial. Then it was on to Roebuck Plains. Highlights for me were my favourite woodswallow (White-breasted), Red-backed Fairywrens and Magpie Geese with goslings. I was surprised to learn that George remembered taking my parents birding some 25 years ago. He particularly remembered that they had Painted Honeyeaters nesting in their front garden. No wonder he's such a good birder with a memory like that. Regardless of what the field guides say, George tells me that there are always a few Common Redshanks in Broome. He had seemed quite confident of showing me one so I was relaxed and expectant as we drove to Little Crab Creek the first time. Somehow he had misjudged the tides and there were no waders to be seen at all, let alone any redshanks. We drove back and admired thousands of waders in Roebuck Bey - truly a spectacular sight. The second time we approached Little Crab Creek I was not quite so relaxed. What if I missed out on this wretched bird yet again? I had looked for it so many times and, if I missed out on this occasion, I reckoned it would now qualify as a bogey bird. In September 2009, at the end of Klaus' Black Grasswren tour, instead of going home, I had flown to Broome from Kununurra in order to look for a Common Redshank. I had tried my best, and the wardens at the bird observatory on my behalf did so too, but I was not blessed with a redshank on that occasion. Broome is a long way from Melbourne. If you put up with the heat, I reckon you're entitled to a lifer or two. As we walked through the mangroves to the entrance to Little Crab Creek we were diverted with Dusky Gerygones, Yellow White-eyes and White-breasted Whistlers. We saw Mangrove Grey Fantails, Lemon-bellied Flycatchers, while Brahminy Kites and a Peregrine Falcon flew overhead. But I was not satisfied with all this entertainment. There was only one bird that would gratify me today. With muddy feet we reached the entrance to the creek. In seconds George had a couple of Common Redshank in the scope for me. Yippee! Two birds I requested and two birds George delivered. I knew then that my trip to Ashmore Reef would be a success.